 USA  2015  117m   Directed by: Tarsem Singh.  Starring: Ryan Reynolds, Natalie Martinez, Matthew Goode, Ben Kingsley, Victor Garber, Derek Luke, Jaynee-Lynne Kinchen, Melora Hardin, Michelle Dockery, Sam Page, Brendan McCarthy, Thomas Francis Murphy, Sandra Ellis Lafferty.  Music by: Antonio Pinto. Sometimes I just don't understand so-called professional critics. I really don't. You give them a very good movie and they complain that it wasn't a lot better than it was. It's like they're going out of their way to be negative. That bothers me and that's why I prefer to call myself a movie "reviewer". I'm just someone who loves movies, sees a lot of them, knows a bit about the industry and wants to use my experience as a writer to discuss movies in a way that others might enjoy and find useful – and from a movie fan's perspective. I'm only out to answer one question when I review a movie: Was it entertaining? If I feel it was, I recommend it, giving it a grade in the "A" or "B" range, depending on how entertaining it was. If it's not very entertaining, or just bad, it gets a "C" or "D". And if the movie is out-right horrible, it gets an "F". Simple, right? Well, "Selfless" (PG-13, 1:56) isn't going to change the world, but it is interesting, fun, thought-provoking and well-made. It is, simply stated, a very entertaining film. What more do we need in a movie? Underneath all its action and intrigue, this movie asks how important a person's life is and at what cost a specific person's life should be preserved. Oscar winner Ben Kingsley plays Damian Hale, a New York City real estate tycoon who is dying of cancer. Like most people, Damian is more than a little unnerved by the reality of his imminent demise, but, unlike most people, he has the ability to do something about it. He becomes aware of a very expensive and very secretive process by which his consciousness can be implanted into a younger man's body, enabling Damian to survive, enjoy life and contribute to society for another 50 years or so. He's rich enough to afford it and arrogant enough to think he deserves it. Professor Albright (Matthew Goode) tells Damian that each body is an "empty vessel" grown in the lab. The body that Damian is given to inhabit looks a lot like Ryan Reynolds. The transition from his old body to his new body (called "shedding") is disorienting. Damian's mind has to get used to seeing a different reflection in the mirror and must learn to adjust to his new physicality. Albright puts him up in a luxury apartment near Albright's New Orleans facility in order to monitor the progress of Damian, Version 2.0. Albright also gives the new Damian red pills to help him suppress upsetting and reoccurring visions. Albright calls them "hallucinations" and says that they're a common side effect of the shedding process, but Damian says the visions feel more like memories. Hmmm. complicated. A sci-fi drama becomes a mystery, a psychological thriller and an action movie with several twists and turns. 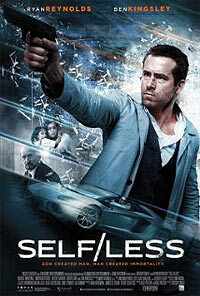 "Selfless" is part "Invasion of the Body Snatchers", part "The Bourne Identity" and a little bit of "The Matrix". There's a lot going on to keep you entertained while you're thinking deep thoughts about the story's bigger issues. Some critics fault "Selfless" for becoming too much of an action movie and failing to more fully exploit the plot's intriguing set-up. But I have a feeling that if they got the movie they say they wanted, they'd have called it boring. This is an original, exciting film that is very well-acted, well-paced (by director Tarsem Singh) and well-plotted (by screenwriters David and Alex Pastor). The moral issues are never far from the moviegoers mind, and are still there to be considered after some of the movie's more frenetic moments have faded from the screen. A movie doesn't have to be completely original to be thought-provoking and entertaining. Review by CleveMan66 from the Internet Movie Database. 'Self/less': Film Review - Hollywood Reporter. 'Self/less' Review: Ryan Reynolds Miscast in Tarsem Singh's Thriller.